Bruxism (pronounced BRUK-sizm) is the technical termfor forcible grinding and clenching of the teeth. It usually happens at night, during sleep, although some people grind their teeth during the day as well. People who suffer from bruxism may also bite their fingernails or pencils, or chew the insides of their cheeks. About half of US adults grind their teeth at night, and about 20% (over 40 million people) grind their teeth in a destructive way. 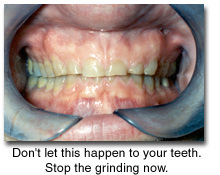 Most people who grind their teeth are over 25 years old, and the disorder affects women and men about equally. Children also grind their teeth, but usually in response to discomfort caused by colds, ear infections or allergies. Most cases of bruxism in children resolve on their own without causing tooth damage or other problems. When you chew your food, your deliver a force of about 175 pounds per square inch (psi) to your teeth. But when you grind your teeth at night, there's no food to absorb the impact, so the force on your teeth can be 300 psi or more. That's enough to cause permanent damage to your teeth, including cracked and chipped enamel, hairline fractures, and even wearing down of the teeth to the gumline. The enamel may become so worn that the inside of the tooth (called the dentin) is exposed. If bruxism isn't treated, it can lead to gum damage, loss of both natural teeth and restorations, and other more complicated jaw-related disorders (such as TMJ known as temporomandibular joint disorders). Over time, your teeth may become sensitive due to exposed dentin, and your jaws may even move out of proper balance. Grinding your teeth can also cause a wide variety of other symptoms including soreness and fatigue in your jaw and facial muscles, and earaches or headaches-especially when you wake up in the morning. There is no known cure for bruxism. Fortunately, there are ways to reduce or stop your grinding and even ways to limit further damage and pain due to grinding. Night Guard is also used as therapy to treat these conditions.